Get 50% discount on carpet cleaning services when combined with end of tenancy cleaning. Make your home or office a more health-friendly place. Customers enjoy a 50% price reduction on carpet cleaning if they combine it with our end of tenancy cleaning. The starting price for bedroom carpets is barely £26. Available for landlords, property owners and tenants. Our skilled staff is able to sanitise a wide range of properties. Prices start at only £89 and you will get a 10% discount if you are a landlord. From barbeques and microwaves to ovens and hobs – we cover it all. We offer single oven and hob extractor cleaning for just £75. Plus, you will get the oven cleaning for free if you decide to combine it with our end of tenancy cleaning. Those of you who need all-round cleaning services in Hounslow TW3, TW4, can always count on us. 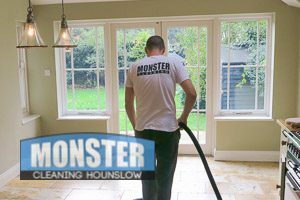 We from Monster Cleaning Hounslow are a reputable and vetted business that covers many parts of London and which receives many positive reviews from its customers. Our coherent team of trained cleaners in TW3 and TW4 is well organised and can quickly plan, organise and carry out cleaning jobs of any character or scale. The prices of all of our services are competitive. If you book us, you will also enjoy a custom-tailored quote and amazing discounts. End of Tenancy Cleaning – available for landlords, property owners and tenants. Our skilled staff is able to sanitise a wide range of properties. Prices start at only £89 and you will get a 10% discount if you are a landlord. Domestic Cleaning – a great way to maintain your home squeaky clean at all times without any effort on your side. Appointments can be scheduled on weekly, fortnightly and monthly basis and our cleaners will thoroughly follow your checklist. Carpet Cleaning – make your home or office a more health-friendly place through this service. Customers enjoy a 50% price reduction on carpet cleaning if they combine it with our end of tenancy cleaning. The starting price for bedroom carpets is barely £26. Oven Cleaning – from barbeques and microwaves to ovens and hobs – we cover it all. We offer single oven and hob extractor cleaning for just £75. Plus, you will get the oven cleaning for free if you decide to combine it with our end of tenancy cleaning. One-off cleaning – transform your property without breaking a sweat or moving a single finger. If your one-off cleaning job costs more than £100, you have the chance to get 1 hour for free if you book us now. Deep Cleaning – the best way to rejuvenate and sanitise any type of property. It is effective and it can be done only by professionals since it requires special equipment. However, it will help you get rid of pollens, allergens, dirt, dust and more. Commercial & Office Cleaning – a smart solution through which you will be able to maintain your work premises spotless and presentable. It can be booked as a regular service or even as a one-time job. For offices – our prices begin at just £8. Driveway & Patio Cleaning – offers excellent results in a short amount of time. Works for many outdoor surfaces and areas and it can remove even things like petrol, oil and grime. The starting price for this particular service is £1.50 per square metre. We can be booked via phone, email our online form. Our work schedule is very flexible and we are available seven days of the week, including on national holidays and weekends. When necessary, we can also organise a visitation after regular business hours. I first started using the company’s domestic cleaning services about a year ago and so far, I have nothing to complain about. My home has been in a spotless condition ever since even though I have not vacuum-cleaned it myself for months. This is great for busy professionals like me. I find the regular rates quite affordable. The cleaners themselves are respectful and they always try not to disturb my peace when they are doing their job. When I decided to move out of my place, my landlord has me such a long end of tenancy cleaning checklist that I thought it would be best if just kiss my deposit goodbye. Luckily, a colleague of mine recommended this company. I imagined it would cost me a fortune but I was given a personalised quote which allowed me to stay within my budget. The team quickly cleaned the whole house and I managed to get my deposit back. Thanks a lot!